A reputed gang member had his tattoos photographed by Lynn officers, including detective Bob Hogan, after being arrested recently for a probation violation. Below, a State Police trooper held a double-edged knife recovered by Lynn officers. It was close to midnight at his 21st-birthday barbecue in Revere when Phong Tran noticed a couple of members of his former street gang by the hedges alongside the house. Tran approached the two men, members of the Piru Bloods, in the darkness. As Tran arrived, one man swung a full beer bottle into his face. He hit Tran twice, striking him on the eye and on the temple. According to Tran and the subsequent police report, Tran staggered away, blood pouring from his head. "You want out now, Blood? That's a violation," Tran recalled his assailant saying. Tran said he had been "beaten into" the Piru Bloods seven years earlier, by older gang members in East Boston. Now, trying to move beyond the gang into a normal adult life, Tran had been "beaten out." Law enforcement investigators across the Commonwealth are soon going to have a new tool to help investigate such incidents. In early January, the Criminal History Systems Board, a state agency responsible for the law enforcement telecommunications network, plans to launch MassGangs, a database that will store information on violent street criminals by describing such factors as associates, criminal history, and tattoos that indicate gang affiliation. This intelligence system, funded by a $1.2 million Department of Justice grant, will allow investigators to share gang-related information in "real time," adding new data to a gang member's history as it becomes available. "This [system] will give officers on the street the freshest information that's available" on gang members, said Curt Wood , executive director of the Criminal History Systems Board. Wood also said the database will be used by the Department of Correction, which monitors activities by "security threat groups" within the prison system. Among many other gangs based on ethnicity, there are about 30 Asian gangs like the Piru Bloods operating in Massachusetts, with more than 1,000 members, according to a 2006 study conducted by the Commonwealth Fusion Center and the New England State Police Information Network. Today, not only in Boston, where neighborhood or "block" gangs predominate, but also in places like Revere, Lynn, Lowell, and many other communities, violent street gangs are a high priority in law enforcement. "Gangs have risen to the number two problem after drugs in the social order," said Lieutenant John Goodwin, 46, gang unit supervisor for the Revere Police Department. Over the past two years, analysts examined similar systems in other states, eventually developing "a collaborative tool that is unique to Massachusetts," said Wood. Investigators from the State Police, FBI, local police departments, and several other agencies participated in the development of MassGangs, according to Wood. Investigators will use hand-held devices and facial recognition software to gather and record information, he said. Police officers who encounter a suspect will fill out a form that assigns a point value to gang-related criteria across 17 categories, including "self admission" (five points); "known group tattoo/marking" (eight points); "group-related photo" (two points); "information from reliable/confidential informant" (five points), etc. An aggregate score of 10 or more points will register the individual as a member of a gang. Information on those, including juveniles, who reach the 10-point mark will be maintained in the MassGangs system for 60 months. It will then be purged unless the record is updated to reflect continued gang association or activity, at which time the retention is reset to 60 months, Wood said. Access to the system is limited to law enforcement agencies, said Wood. The system will organize information that police already gather, muting issues of privacy, said one local law professor. "If it's a violent gang, that's information the police are going to have, anyway," said Robert M. Bloom, a Boston College law professor and former prosecutor and defense attorney. "What [MassGangs] is doing is providing that information in an organized way. "Does it violate someone's privacy? Yeah, but your privacy is violated every time you're arrested, and the fact that you're a member of a gang is useful to future police investigations. "Once police have that information [on gang members], whether we like it or not, they share it," said Bloom. "If a crime has been committed and they think a particular individual committed that crime, would gang affiliation be useful in establishing probable cause? You betcha." Gathering up-to-date information on gang alliances is the key to infiltrating and disrupting them, according to investigators. In Lynn, police detective Bob Hogan, 43, carries a police radio, a Nextel phone provided by the FBI North Shore Gang Task Force, and his own digital camera and iPhone in an attempt to accomplish what the new MassGangs device will do more efficiently. "If I ever get shot, all the stuff in my pockets will probably save me," he joked. But in January, Hogan will help enter the data on local gang members that Lynn police have assembled into the MassGangs system. Lynn's database contains between 1,500 and 1,700 profiles, according to Hogan. "Right now, if I grab a kid from Chelsea, I have to call [Chelsea Police Detective Scott] Conley on the phone," said Hogan. "To have [MassGangs] will be a lot more convenient and contain a lot more intel." A week after Phong Tran was attacked in late August, he visited Revere Police to file a complaint against his alleged assailant, Sarith Ron, of Chelsea. According to the police report, he lost 3 pints of blood and required 30 staples to close up the wounds on his face. His eye was swollen shut and one track of staples formed an ugly, braided question mark on his forehead. Revere gang investigator Rob Impemba and Chelsea detective Efrain Gonzalez arrested Sarith Ron on charges of mayhem and assault and battery with a dangerous weapon. Currently Ron is free on $500 bail and awaiting trial. MassGangs will allow police to track gang members moving between tightly knit ethnic communities, according to investigators. Lowell has the second-highest Asian population in Massachusetts and an active gang culture dominated by the Tiny Rascals Gang, Asian Boyz, and several sets of Bloods, according to Lowell police and the 2006 study. 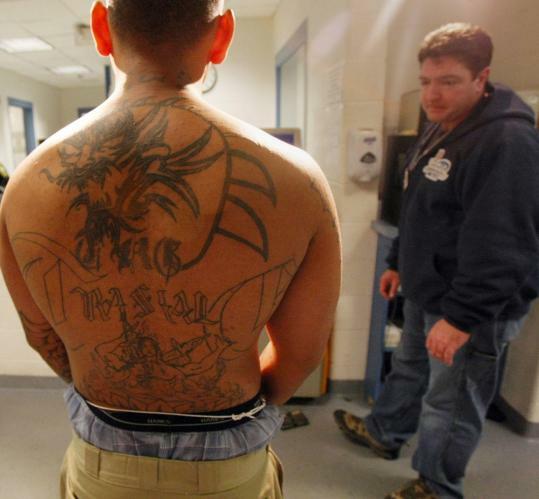 Like their counterparts in Lynn and Revere, Lowell Police have significantly blunted the impact of these gangs by collaborating with the State Police, FBI, Middlesex Sheriff's Department, and gang units from other local police departments. On a late October evening, Lowell police detective Dave Lally is patrolling the city with a sergeant from the State Police gang unit. On this cool, rainy night, the streets are empty but just before 11, Lally hears that a "senior member" from one of the Asian gangs is willing to talk. Lowell detectives have taken him to a secure location, protecting his identity with the aim of developing new intelligence on gang activity. Drugs, the gang's principal commodities, are shipped in by out-of-state gang members and are usually sold on the street by junior members, he tells the officers. Senior gang members typically isolate themselves from "hand-to-hand" drug dealing, referred to as "slinging," he says, by arranging for younger ones to distribute and sell the pills. Senior gang members sometimes use profits from the drug sales to purchase guns, also brought in from out of state, that are resold, usually within the gang. The guns are used to settle disputes, referred to as "stepping on toes," when a rival gang member tries to move into the wrong neighborhood or street corner. He "steps on my toes, he gets shot," says the gang member.